Beautiful newer condo complex located close to everything! 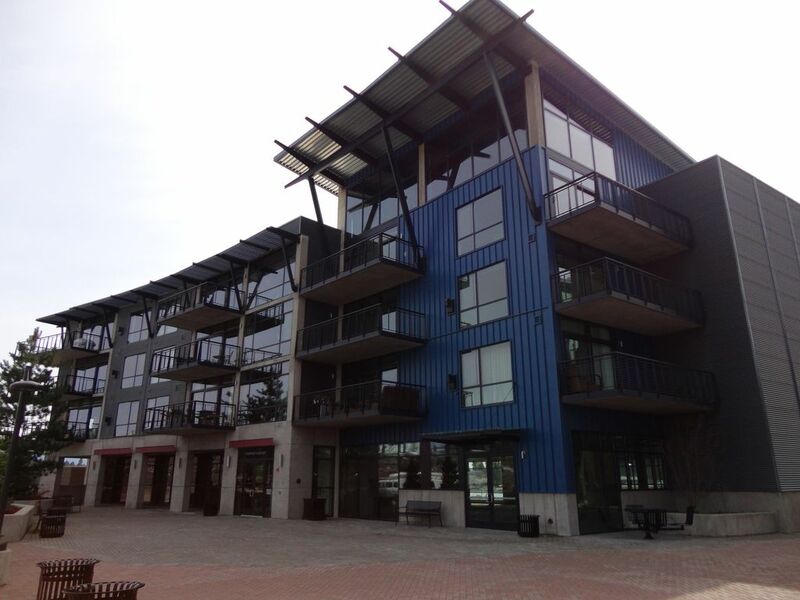 This condo is not waterfront, but you do have access to the docks. On the ground floor of the building is the acclaimed Le Peep Cafe. Walk to Zi Spa from the front doors! Bike or walk the Centennial trail right in front of the building. The condo is furnished with a king size bed in the master and a twin over double bunk bed in the 2nd bedroom. It has a custom kitchen fully furnished with all the utensils and dishes you could need for your stay. Right up the road from the condo is the Riverstone complex with shopping, movie theater, and several outstanding restaurants. Take a short drive, and you have access to four different ski resorts. Coeur d' Alene is an absolutely beautiful place to visit any time of year, and we would love to host you in our beautifully decorated condo. Loved being near the Centennial trail, river, restaurants and entertainment. Our riverside condo provided comfy bed and stocked kitchen. The accommodations were sufficient but dated. Needs an update. We absolutely loved this condo! It was well stocked with everything we needed. The rooms were comfortable and clean. There are many shops and restaurants within walking distance. The balcony was such a nice place to hang out in the evenings. The condo was immaculate and we could not have asked for better! It was also in a very quiet neighborhood. We certainly hope to return. We had a great stay. The unit was very clean and was well stocked with kitchen supplies and other conveniences. The location is great- right on the Centennial trail. We hope to stay again!! Beautuful location, right on the water. Note that this unit does NOT face the water though. Very spacious with plenty of room for our family of four, plus a sister in law for a night. A few very small issues that were dealt with immediately. Will be coming back for next years Ironman race. Great spot! Clean, new, awesome location, stocked with everything you need. Condo was in perfect shape. Clean and new. Great breakfast spot in the building. Starbucks across the street. Quick to downtown and the freeway. Everything I wished for was there. Coffee, soap, shampoo, washer dryer stuff. Secure parking. Easy building access. Quiet building. All around great stay. Would do again. We love the Coeur d’Alene area and were very excited to stay in a nice condo close to town and many other activities. The Condo has amazing potential with a few tweaks. The deck is covered in bird poop and literally on everything. We wanted to use the grill, but between the deck being disgusting and the cover to the bbq having nasty stuff on it, we couldn’t use it. I went out on the deck twice, but every time I had the stuff on my shoes and didn't want to bring it into the house. The shower door does not properly close. When you do try to close it, you feel like you’re going to break the shower door. When I went to grab a towel off of the towel wrack next to the shower, half of the rack feel off of the wall. The 2 couches in the living room are literally falling apart. The right side of the love seat is almost falling half way to the floor. The right side of the main couch motor for the foot rest is definitely going out and snaps several times while going up or down. The Vizio flat screen is very old and froze every time we tried to watch Netflix or stream anything. There were a good amount of DVD’s so we watched some of those. It was also just in general not very clean. Like I said, with a few fixes it is an amazing place. Sadly they have some worn out and deficient furniture and fixtures. This is also, the first bad review I’ve ever written. I feel bad, but it has to be reported some way. I also took pictures of everything. While there is an issue with birds nesting at the top of the building, we do have the deck cleaned regularly. It was cleaned 3 days prior to check-in. Had we known that this was an issue with the guest, we would have sent some one over immediately to clean it. It is disappointing that NONE of these issues were ever brought to our attention (until this review 20 days later! ), as we would have done everything to remedy them and make the guest's stay more enjoyable. Our cell phone is given for contact. We are addressing the issues now, and would have earlier if we had known. Our aim is to provide an enjoyable experience during your stay, if there are issues we are available to fix. But we need to know about them first. Cancellation Policy. Owner has a strict No Cancellation Policy.